The easiest way to teach kids to put their shoes on right, all by themselves. Shoezooz promote independence, problem-solving, self-sufficiency. Great tool for kids with special needs. 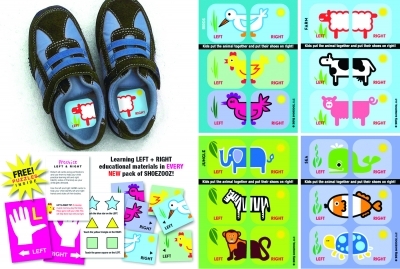 Left/Right learning/puzzles FREE inside! I love this product! . It is perfect since it has the words and the picture. My three year old struggles with putting her shoes on the right feet and this will foster independence. Amazing product for the 18 month old so we can start the learning process! !